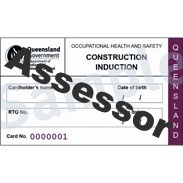 Under the assessment requirements for the new unit CPCCWHS1001 Prepare to work safely in the construction industry (unit required for the White Card) when it gets released, assessors will need the unit of competency CPCCOHS2001A Apply OHS requirements, policies and procedures in the construction industry. PCD Training offers CPCCOHS2001A Apply OHS requirements, policies and procedures in the construction industry as a stand-alone unit. You can complete the unit online, in your own time. You can enrol 24/7, complete in your own time and even pay for the unit right at the end. As soon as all tasks have been completed, and we have received your fees, you will have instant access to your Statement of Attainment for CPCCOHS2001A Apply OHS requirements, policies and procedures in the construction industry. You will be emailed a copy immediately, have instant access to it in our e-learning system and we will also post you an original copy. For more information on the assessment requirements for the new White Card unit CPCCWHS1001 Prepare to work safely in the construction industry, click here. To view the unit descriptor for the unit CPCCOHS2001A Apply OHS requirements, policies and procedures in the construction industry, click here. To be eligible for a Statement of Attainment for the unit CPCCOHS2001A Apply OHS requirements, policies and procedures in the construction industry, you need to successfully complete all of the unit's tasks which have the assessments, and have paid your fees of $300.00. Further details on the assessments can be found under the tab 'Assessments'. A participant has a twelve (12) month enrolment period to complete the unit. Information on the CPCCOHS2001A unit can be found here. 1. The Estimated Duration is the nominal hours attributed to CPCCOHS2001A Apply OHS requirements, policies and procedures in the construction industry. This is the expected hours for attendance in a classroom environment. The actual duration it takes you to complete the unit/s can be different as a result of a number of factors, including previous knowledge, experience, personal situation, etc. 2. The Fee applies at the unit level for on-line access. There are no designated entry requirements for this course. However, you will need a sound working knowledge of basic maths, e.g. addition, subtraction, division and multiplication and be able to read, write and understand standard English, similar to what is used in this information. You must also be able to send and receive emails with attachments and install software. You will also be required to upload files, photos, video responses, etc. You may also need to download files using a web browser. You will also need access to a computer which has, or on which you are able to install, a web-cam. All personal information is collected for the purposes of enrolment requirements only. Specified information from the enrolment is required by federal legislation to be reported to the national VET regulator for statistical purposes only. Your information will NOT be shared with any other party. You will NOT be able to access your Statement of Attainment until all course fees are paid in full. .
1. Computer marked questions: true/false, multi-choice, multi-answer, click-the-image, click-in-order, fill-in-the-blanks, etc. 2. Uploading of files: complete reports, assessments, etc and upload for assessing by a PCD Training assessor. 3. Video responses: complete a video response to a question/s in our e-learning system and submit for assessing.